While rice cooks, heat oil in a large nonstick skillet over medium-high heat. Add onion and garlic; saut 3 minutes or until tender. 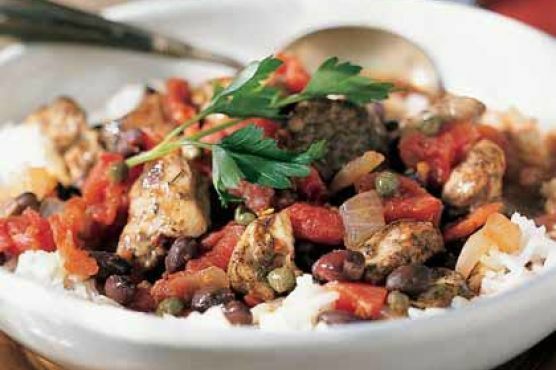 Combine chicken and the next 5 ingredients (chicken through black pepper) in a bowl. Add chicken mixture to pan; saut 4 minutes. Stir in wine, capers, beans, and tomatoes. Cover, reduce heat, and simmer 10 minutes or until tender.